John Wick is back in the first trailer for the franchise's third action packed installment. The first look at the film is as stylish and intense as you might expect. 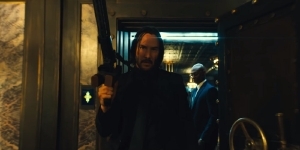 John Wick: Chapter 3 is directed by Chad Stahelski, who also directed the first two films. Laurence Fishburne and Ian McShane will return to the franchise along with Halle Berry and an appearance by Jason Mantzoukas. John Wick: Chapter 3 — Parabellum will hit theaters on May 17.